I am always trying out a new after school snack for the kids. I seem to gravitate towards something warm like fresh baked bread with butter and honey or cookies right from the oven. Sometimes a small bowl of noodle or alphabet soup does the trick too. However, lately this has been hitting the spot….for me and for them. Anyway, this is so easy to make, you’ll probably whip it up more than you should. I know I do. 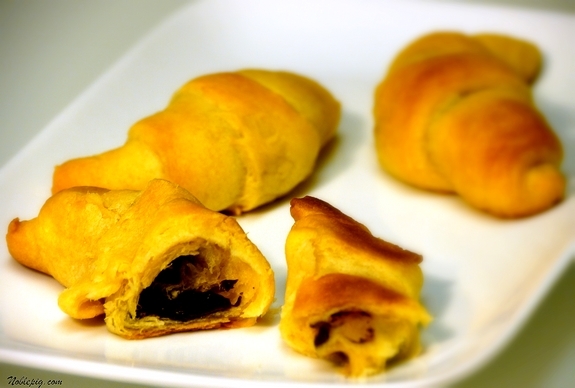 With a cold glass of milk, these Chocolate Croissants really take the sting out of homework. Unroll and separate a tube of 8 crescent rolls. 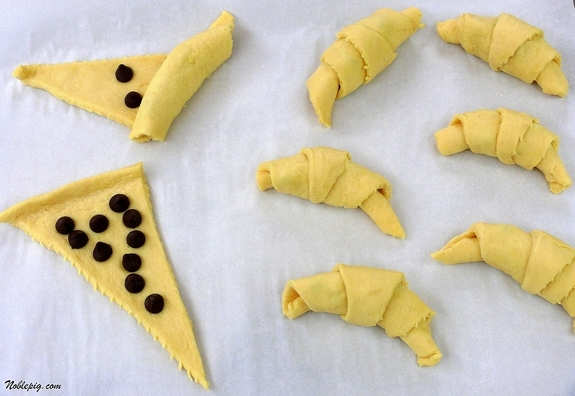 Place about 10 chocolate chips on the bottom of each triangle and roll the dough up around the chocolate. Place on a baking sheet and put in a 375 degree oven for 12-14 minutes or until golden brown. Remove from the oven and brush with melted butter. Serve warm or at room temperature. This is going to make your afternoon! mmmm…I use to get these every morning at Java Junkies, ya know…when I HAD a job….but now I can make them for myself! So there, Mr. Bush and Mr. Madoff…take THAT! Try using cinnamon chips next time – divine! I’m still all over the PB chip cake! Those look delicious. I would never have thought about putting chips in a crescent. I’m getting those the next grocery trip and surprising Boo. And those plum & nectarine crisps look good too. This looks so easy and the filling possibilities seem endless. Aren’t these good?! I made them once only I melted some of the chocolate chips then drizzled that on top once they were cooked and sprinkled on some powdered sugar. They were gone in seconds! It does not get much easier than this, does it? I will have then neighbors children come for after school snacks!!!! Oh, I have done these before. They are so easy, yet so decadent. Lucky little boys. I love these. Sometimes I’ll add pb and/or marshmallows or marshmallow cream in with the cc. Delicious! mmm, cwah-sahns. 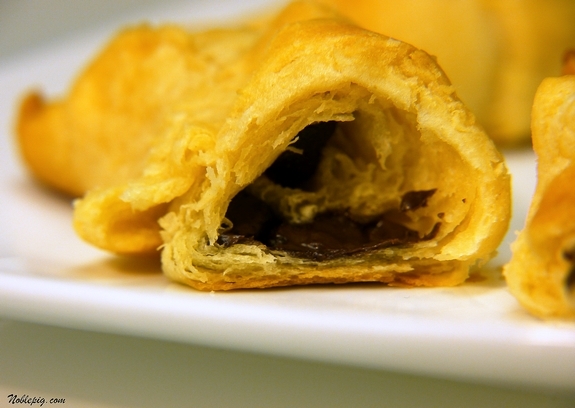 such buttery, flaky goodness, and here you’ve gone and escalated them with chocolate. bravo! Not to rain on your parade, but my doctor is telling me that it is 78 years of eating breads and desserts with white flour – not what I’m now eating! – that has my blood sugar elevated. I always thought I was being the “good mother” by having home made bread, cookies, cakes, etc. for my children…turns out I should just have been pushing grapes, pineapple, oranges, apples, etc. and finding ways to make them seem like special treats. Help us out with that Cathy. It doesn’t get easier than this! What a delicious snack warm out of the oven. Strawberry jam would be good too. Yum 🙂 Our favorite snack lately is very similar (you should try it): Croissant’s with a spoonful of Nutella rolled up inside. My kids LOVE it! Yeah…there’s not a kid in the world who wouldn’t scarf all of these down! Can I come home to your house after school? Those look absolutely delicious! OMG… too easy! I’d probably eat the whole pan! If I made these, my daughter would want to eat them all! She takes after her old mom just a little. Oh, gosh — these remind me of the chocolate croissants we can get for brunch at our local French bistro. That’s way better than what I got when I came home from school! Well, until I started cooking for myself anyway. Heh. My mom grew up on a chicken ranch and fondly remembers the cream puffs my granny would make them for after school snacks. Made with fresh eggs from their chickens and fresh cream/butter from the neighbors cows. I can only imagine how good they were. I am getting in the car now, be there when school is out! I haven’t even made the cake yet! I went and bought the ingredients, whew expensive cake. Everybody is getting excited to have something sinfully rich around here. Great idea for the little ones! Will have to treat them to this someday. Thanks! I bet school kids could eat a mountain of these chocolate treats! Your recipe for plum/nectarine tarts in Davis Magazine this month is really mouthwatering tempting. A great combination of fruit too. Looks yummy. I will try them when the produce comes in the market and I can get really fresh fruits. Fall is a great comfort food season! Thanks for this recipe. I am so making these! My kids will think I’ve been replaced with an alien though. Their snack is usually, “something healthy”…..poor deprived kids! My daughter would love these! And best of all she can make them herself! That’s unfortunate Joan, but maybe it’s partly genetics too. My mother made lots of bread, cookies, cakes & pies, most of it created with home made butter and cream. We rarely had fruit in the house that wasn’t grown on the farm, which was limited in Northern Ontario Canada. Amazingly enough, she enjoyed great health and passed on at 94. Her good genes have been passed along to us kids – I have perfect cholesterol, normal blood sugar & enviable blood pressure. Isn’t the name of the “health” game about balance anyway? Cathy, you go girl. The boy’s are going to remember those after school snacks – they’re likely getting their fruit at breaky & lunch anyway! These look delicious and they’re made better still because they are so easy to do. Yum, Chocolate in or on anything and I’m glad. I love the simplicity. I have something similar to this waiting in my archives to be made. Thanks for the push!!!! Um, teachers need afterschool snacks too, right?! My daughter will thank you a million times over…but she’s also twelve, and at that age where extra butter and sugar might not be the best thing for her. But who wants carrot sticks after school (or any time)? I am not making those again! I made them once and ate half in one sitting. Bad girl! OMG what a great idea! My kids will go crazy for those! Man I wish I had these when I was a kid!! Those photograph beautifully! Nice job! Oh yeah, my son would be happy to come home from school and find these waiting for him! Great idea Cathy! And I love the sauerkraut cake. My husband found a chocolate cake recipe that calls for sauerkraut in it and I couldn’t believe it. Maybe I will try it after all…. Clever girl. Why didn’t I think of that? Nice. Why didn’t I have a mother like you waiting for me when I came home from school? Quick, simple and so delicious. I will be making these next week. My children will be thrilled! I could go back to school just to have an after school snack like that ;)! Brilliant! My kids will go nuts for these! This is great! My son used to come home and make himself a package of crescent rolls whenever I had them available. I never thought they were all that appealing on their own, so I wonder why I never thought of this. A little added chocolate and they look fantastic. I want a bite right now! How cute are those? I wish my mom had thought of this when I was a kid. Yum! I love chocolate croissants! Great snack idea! one word perfect… making these for sunday brunch. How simple is that? And a lot less expensive than store-bought. Yum! Had to comment to let you know I made these yesterday. Wow. I ended up eating three of them. Good lord, delish! I added a little PB to a couple of them like some commenters suggested. Yum. Thatâ€™s great, I never thought about The Best After School Snack like that before. Some specialists state that personal loans help a lot of people to live the way they want, just because they are able to feel free to buy necessary stuff. Furthermore, banks give secured loan for all people. I have a recipe that is supposed to be a modified brioche recipe (French, you know). Cut the crescent rolls into squares (3 each roll), try to smooth out the perforations, tbsp of choc chips in each, bring corners up & pinch together. Bake (probably similar to yours–I don’t have my recipe in front of me). Sprinkle with powdered sugar & serve warm. They do reheat just fine in the microwave, btw.